MD livingdesign is not just another normal furniture company. Our company vision is based on the idea of utilizing a room more innovative and effective, about a style, that differentiates itself from others. Our style. The televisions of the todays generation are high-tech. We asked ourselves: “Why aren’t we showing and presenting such a high-tech device to show its best advantage?” You neither need a wall nor a big space-robbing furniture to place the television on. Open living is lifestyle. Our concept is to enable it, to see this lifestyle and to enjoy it to the fullest. Our products are made from massive steel and have an integrated turning mechanism. Your television can be used from all your living areas. Whether when cooking, on the couch, at dinner or during a barbecue on the terrace. But also in offices, entrance areas, gastronomy or simply as a stylish residential element. We started at zero. Now it’s sports stars, artists and other celebrities who want to enjoy this lifestyle at home. We are keeping it exclusively. You will find MD neither in other stores or in other onlineshops. Our wholesale is our website. MD livingdesign is an independent brand. We emerged from the idea to use rooms more innovatively. But that in our style. Now we are here ! 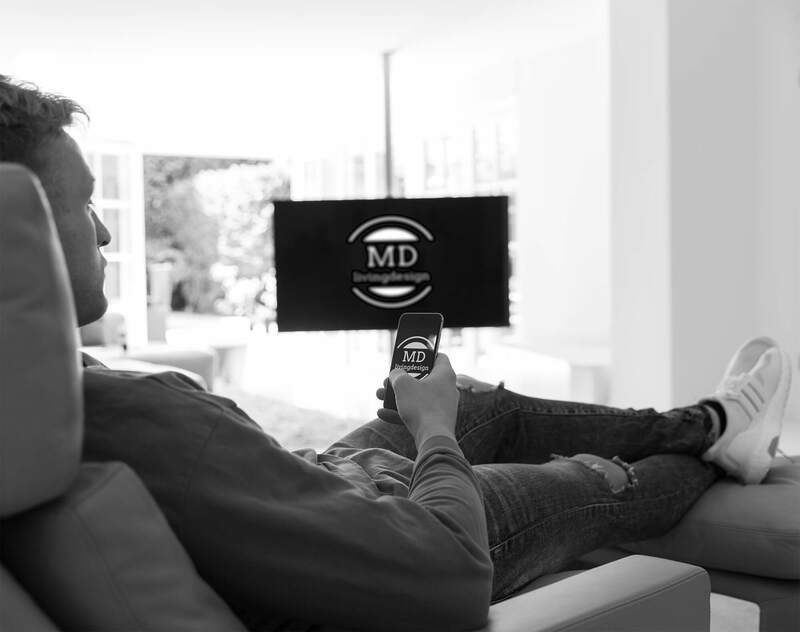 The unique selling proposition of MD livingdesign will be our developed technology to operate the turning mechanism of the television via Bluetooth. Whether with our provided remote control. Our App will enable to save and name the most frequently used end-positions of the television. One touch of a button and the television moves automatically up to 360 degrees. Available also via upgrade. We produce exclusively in Germany. Please inform me about the latest news!